Create audiences based on visitors' previous activities (e.g. pages viewed), conversion stage, referral source, and other behavioral data. Buttons clicked, pages viewed, PDFs downloaded - through website activities (=behavioral data) visitors tell you what they want and where they are in your conversion funnel. The same is true for contextual data - where visitors come from and who referred them indicates how you should communicate with them. Personalize based on conversion stage: Desired actions change along the conversion funnel. First-time visitors need to be educated, leads need to become customers, customers need to be retained... Yet most websites say the same to everyone. Make content and buttons stage-specific and your users will move through the conversion funnel much quicker. Dynamically lower conversion barrier: Generally, CTAs are static - you could visit a page 100 times, the CTA would always be the same. Some people might feel intimidated by a "call us" button, swap it out for "email us" for visitors who haven't performed an action after visiting your website multiple times. Personalize for anonymous traffic: Just because a visitor hasn't interacted with your website before, doesn't mean that you can't personalize their experience. You get a lot of traffic from AppSumo? Most Sumo-lings are freelancers and SMEs - highlight how your tool caters to their needs. Personalize for direct traffic: If a visitor types your site's URL into the browser, that means they either know you well or someone referred them to your website. Personalize their experience accordingly. Highlight new and improved features for direct, returning visitors. Put an emphasis on social proof for new, direct visitors. Personalized suggestions: The pages people visit tell us a lot about their interests and buying intent. Someone read three blog posts about "Accounting for SMEs"? Suggest a White Paper about a matching topic and get this person's contact details, so sales can reach out. Personalize for organic traffic: Which of your pages have high search ranks and get much traffic from search engines? While search engines (no longer) tell us a visitor's search query, we can make an assumption based on the page they landed on. Try to associate your most trafficked pages with user personas, and create a messaging that speaks more directly to search traffic. Website tailored to buying intent: A visitor has already viewed your /pricing page three times? They have downloaded two of your white papers? Clearly, this indicates buying intent. Adjust your CTAs, maybe display a special discount to push them towards the desired action. Piggyback on your referrers' image: Do you collaborate with brands, affiliates, or influencers who link to your website? Piggyback on the trust they have built with their followers by mirroring their tone-of-voice and repeating their endorsement. Personalize both, landing pages and follow up pages to reassure visitors about the trust the affiliate puts into your business. 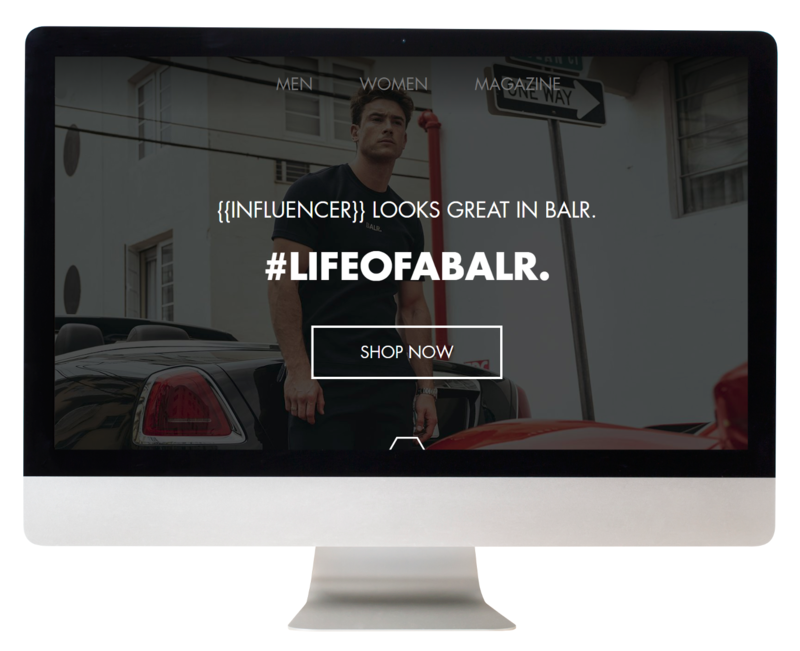 Dynamic social proof: If you collaborate with many, small partners (also known as micro-influencers), creating affiliate-specific website variations would be too much work. For this use case, simply add a dynamic message or quote. New vs. Returning Visitor: For this condition, we set a cookie that kicks in 30 minutes after the initial user session and lasts for two years (or until a user clears their cache). Remember: We're not able to identify users who were on your page before you installed the Unless script. To create a "new visitors" audience, set returning visitor to "false". 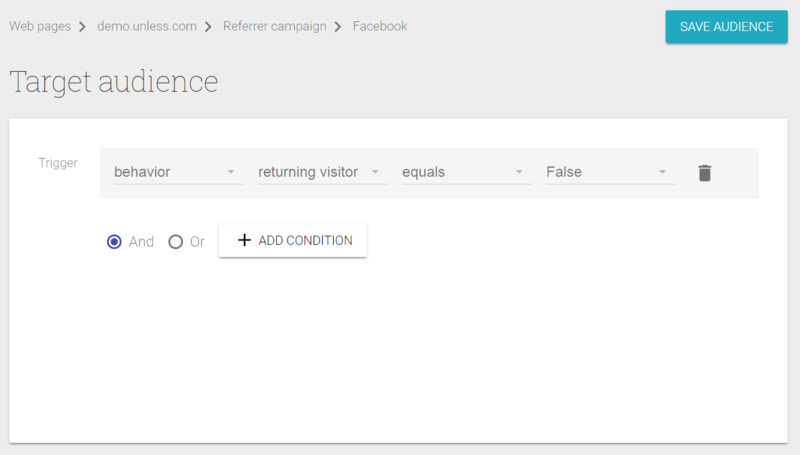 Page Referrer: Use this to target visitors who land on the page through a referral website, e.g. Facebook. The trigger "is empty" can be used in the opposite way to create a variation that is targeted at all direct traffic. Remember: for many websites, there are several different referrers (e.g. Facebook → m.facebook.com, facebook.com, l.facebook.com,...), so it's best to check your Analytics and define the condition using "contains". 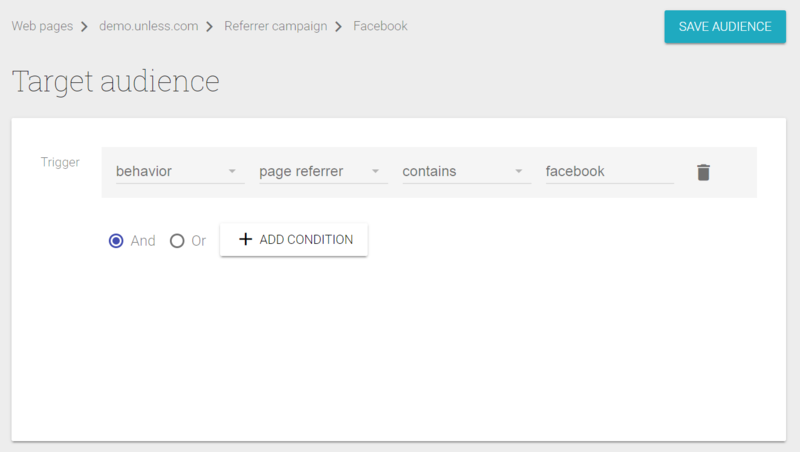 As you can see, we cover all possible Facebook referrers by using the condition "contains". Current Page (Path): Target visitors who have visited specific pages. The condition will trigger the moment a person visits the page you defined. They will remain in your audience for the duration of the membership. 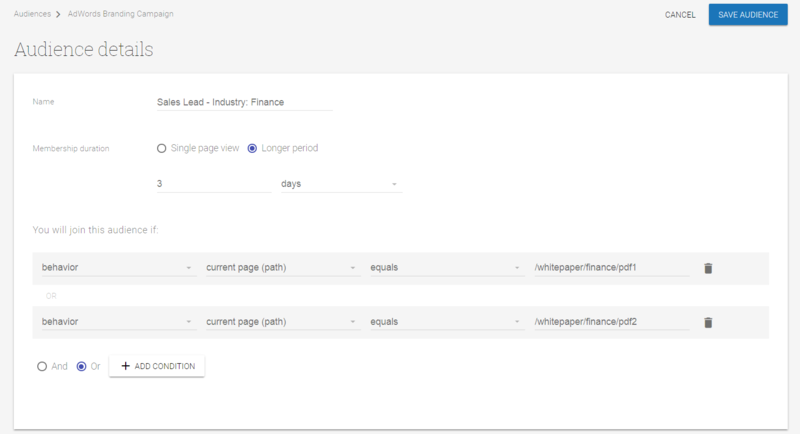 In the example above, every visitor who looks up one of the Finance PDFs will join the audience "Sales Lead - Industry: Finance". They will remain part of this audience for three days which gives us the opportunity to personalize their experience with targeted messaging - e.g. "We have the #1 solution for Finance& Banking". Landing Page (Path): Target visitors who have entered your website through a specific page. Current Domain: This condition is mostly used to create excluding audiences. Example: create an audience for "current domain contains blog.mysite.com" to exclude everyone who entered your website through the Blog from seeing personalizations. Cookie: Target visitors for whom a specific cookie has (not) been set by your application. You can even create new cookies. We wrote a separate guide for cookie-based personalization. Next, you can set up an audience based on the event name. On the Unless website, we use an audience called "LoggedIn". It tracks whether a visitor performed the login event before. Through audience membership, we can then personalize their website experience to make it more relevant for customers of Unless. Remember to correctly use the AND/OR function. For example: Your variation can target users from two referral sources but a user can only be referred from one page at a time. So, use the "OR" function to combine those triggers. When applicable, try to use the "contains" trigger instead of "equals". This is especially true for triggers based on Page referrer. In a separate guide you can learn how to create audiences based on direct and organic traffic. Unless checks your audiences in descending order. If the visitor doesn’t match the first audience, it checks the second audience, then the third, and so on. And if a visitor doesn’t fit into any audience you created, they’ll see the unpersonalized, default version of your website. © 2016-2019 Unless, all rights reserved.